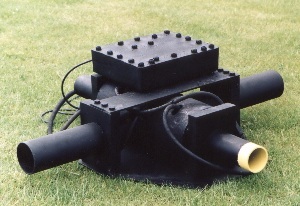 An infrasound fish scaring system is shown alongside. 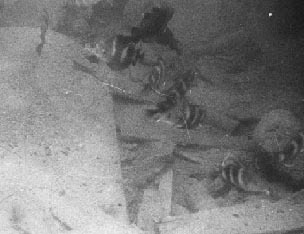 Fish can be a problem during underwater operations. They are attracted to lights and activity. This can result in camera vision being seriously obscured and the swim bladders present spurious echoes to acoustic systems. Fish can be scared by very low frequency sounds at high intensity. Typically the frequencies are lower than 10 Hz. These low frequencies do not interfere with the much higher frequencies used in acoustic imaging and profiling sysyems. The frequencies need to be taken into account when designing camera supports. Camera support brackets need to be reasonably stiff to ensure that the natural resonant frequency is at least 20 Hz. If the stiffness is insufficient and the natural frequency is low then the effect will be similar to the low frequency resonance famously encountered on the Millenium bridge in London. The frequencies used in these systems are close to the natural resonant frequencies of the human respiratory system and therefore are potentially dangerous to divers in the near vicinity and must be used with caution.